Sometimes you can update a light fixture in a bathroom just by swapping out one kind of shade for another; shades maybe small but they can really make a difference. 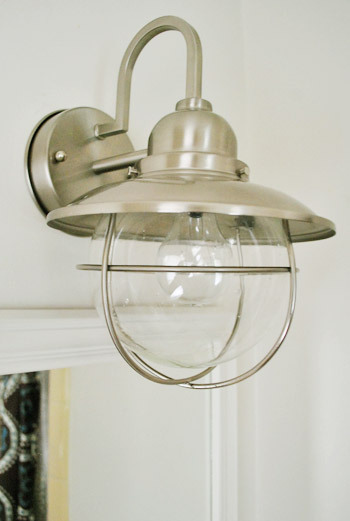 Sometimes homeowners have to bite the bullet and let go of an outdated or undesirable fixture. Click here for some inspiring bathroom lighting ideas. 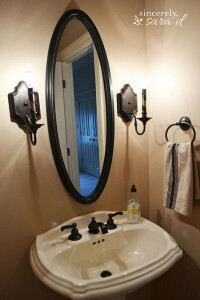 Sherry and John over at younghouselove.com had grown tired of the heavy lights above their bathroom vanity. It wasn’t heavy so much in the terms of weight, but in look. The shades were big, clunky crystal things that looked like they’d be more at home on a tea table than above the bathroom sink. And the electrical base was just so much featureless shiny chrome that overwhelmed the wall space. Ready to update their traditional bathroom lighting fixtures and convinced that this would be a five minute fix, Sherry and John went ahead and bought more modern replacement lights; a sleek two light fixture with seeded glass. After turning the breaker to the electricity off for sake of safety, removing the old fixture was easy. John kept careful notes of how the old electrical base was wired so he could connect the new model without a hitch. Sure enough he had the new light in place in a jiffy, but when he and Sherry stepped back to have a look at the finished install, they made an unpleasant discovery. The plastic bases that the light bulbs screw into protruded below the lower edge of the light housing. 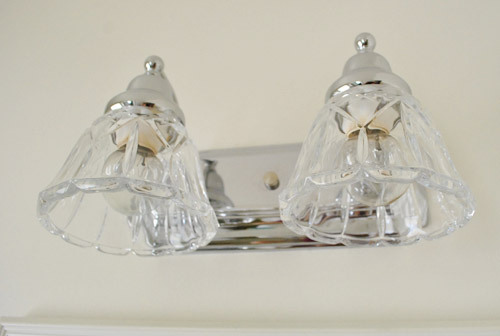 This had been disguised in the old fixture by the faux cut crystal shades. The seeded glass shades in the new fixture were much less forgiving and the overall effect the couple were after was ruined by that expanse of plastic socket. The couple went back to the drawing board. This time they settled on a single bulb, industrial style, globe fixture. It sported a shade that featured the same seeded glass they had loved so much in their original replacement. The housing of the globe effectively shielded the bulb socket from view. 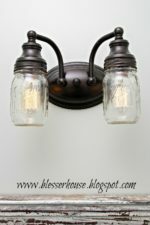 The only feature of the new light that they weren’t immediately sold on was the wire “cage” that encased the shade and bulb. They are still in the middle of updating the rest of the bathroom and are keeping that shade cage tucked away safely just in case. They may decide they want it back in place after other upgrades around the bathroom sink are finished. So if you’re browsing for vanity light fittings take the time to double check that the shade will go with the fixture. And if you do make a mistake, don’t be too hard on yourself, it happens to the best of us! You can find more bathroom decor inspiration here. 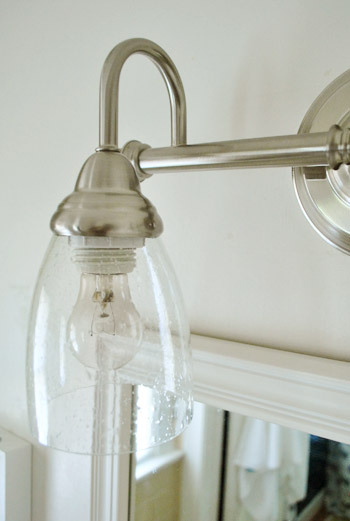 Bathroom Vanity Light Fixtures…Up or Down!? Sign me up for the RenoCompare newsletter! RenoCompare was setup to be an online library of home improvement, renovation and remodeling comparisons, ideas, pictures and much more. Our site caters to both homeowners and professional home improvement contractors, providing everyone the ability to review, research, and compare all types of projects around a home, apartment or condo.